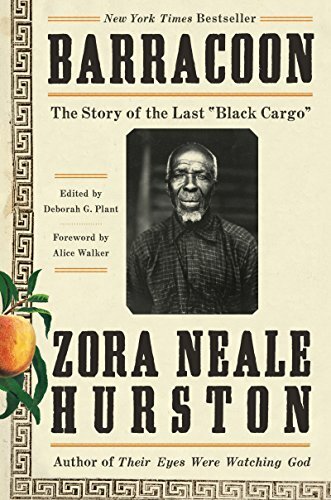 a book review by James H. McDonald: Barracoon: The Story of the Last "Black Cargo"
Anthropologist/folklorist/journalist Zora Neale Hurston used her polyvalent talent to produce the only recorded Trans-Atlantic slave narrative based on extensive interviews with Kossula, or Cudjo Lewis, with whom she worked in 1927. The oral history captures life in Africa, the Middle Passage, American slavery, and life in the not-so-reconstructed South. The book’s enduring thematic is painful loss and the need to profoundly persevere. It is important to recall that the United States outlawed the importation of slaves in 1808, though rogue shipments of slaves still occasionally made their way westward. In 1859 or 1860 the final clandestine slave ship, the Clotilda, delivered its cargo of 110 slaves to Mobile, Alabama, under the cover of darkness. On board was Kossula. Kossula’s voice is written in dialect. While this makes the reading slow going, it gives us a sense of the sound of his voice, almost like a recording, drawing in the reader as if we were there. The oral history unfolds in West Africa in the what is today Benin. Kossula’s community was part of the tributary economy of the Kingdom of Dahomey. Regular conquest warfare and raids netted slaves that entered the European and trans-Atlantic slave trade. Kossula endured slavery for five and a half years until freed at the end of the Civil War. He and other remaining West Africans founded the small community in Africatown, just north of Mobile. There he marries and has six children. Three die of sickness, two of violent trauma (one a gunshot to the throat by a sheriff, and another to a horrific train accident), and one leaves/disappears. The incident with the sheriff is a reminder that black southerners could and were arrested on all manner of trumped up charges. This fed a system of convict leasing, a form of neo-slavery, whereby convicts were leased out to mines, fields, and factories. The Alabama coal mines were the worst with an annual death rate of 17%. Not surprisingly, the Alabama prison population skyrocketed from 374 in 1869 to 2,453 in 1919. His wife, Abila (Celia or Seely), dies as well. The narrative closes with a parable from Kossula about loss. We are intentionally left in an emotional void. Hurston closes by saying, “When I crossed the bridge, I know he went back to his porch; to his house full of thoughts. To his memories of fat girls with ringing golden bracelets, his drums that speak the minds of men, to palm-nut cakes and bullroarers, to his parables.” Even after almost 70 years, Africa was still a place of yearning and dispossession. Barracoon is best thought of as a hybrid text. At once a field recording, a research report, and a descriptive oral history narrative. Hurston is gently present in the text. She does not hide the fact that she, as researcher, was part of the process. Her questions shape the direction of the conversation, but there is very little overt analysis. The emergent relationship between Hurston and Kossula is the most fascinating revelation as they exchange foods and enjoy them as part of a shared human experience. It is useful to close with some additional context for understanding and situating Barracoon in the larger social science scene of its day. Hurston was a student of Franz Boas, the father of American anthropology. Training in the Boasian tradition weaves together two interrelated approaches relevant to understanding Hurston’s work. First, Boas’s students practiced intensive ethnographic immersion with special attention to particularistic detail. Second, many were sent out to record what was thought to be the last vestiges of dying cultures through what was termed “salvage anthropology.” Hurston’s work with Kossula clearly squares with both. As Hurston and others have noted, Kossula might best be thought of as a West African griot—poets, musicians, and storytellers who are the keepers of oral history and cultural memory. He is a man of deep memory that weaves into stories that span two continents, great distance, and a lifetime of experience.